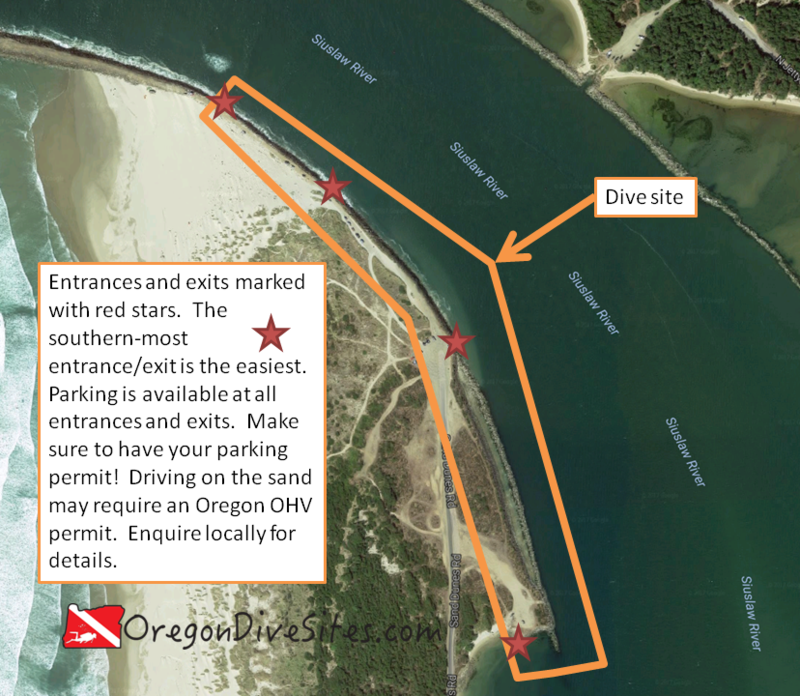 Along the Siuslaw River in Florence the south jetty middle area is a good place to check out for some drift diving. You can also do out-and-back dives but the current that often rips along the jetty wall is more appropriate for drift dives. If you bring your mesh bag and a crab gauge, you probably can limit out on crabs here if you’re doing a longer drift dive. This is a pretty good place to spend a lazy afternoon underwater on the Oregon coast. This is a great drift dive. Hopping in the water when you’re a little ahead of high tide is like riding a freight train. You’ll zip right along the jetty heading up into Siuslaw Bay. If you try to do this dive with the tide racing out to sea, you need to be very experienced and ready to exit over any part of the jetty so that you don’t end up outside the jetty out in the ocean. There are a lot of crabs and fish along the jetty wall. Bring your crab collection equipment and spear gun, and you’ll probably catch something good. Florence, Oregon is just over the bridge on the north side of the Siuslaw River. Turn onto South Jetty Road from US101. Bear right onto Sand Dunes Road by the Odd Fellows Hall. Be sure to pick up a parking pass for the day by the entrance to the county park. Drive all the way down Sand Dunes Road to the end. You are now in the middle of the south jetty middle area dive site. This is a county park so be sure to get a day parking permit. There usually is plenty of parking in several different areas. Parking out along the jetty in the sand might be allowed with an OHV pass. In the past we saw people do this. However, inquire locally before you drive into the sand to make sure you won’t come back to a ticket on your car. The south jetty middle area at Florence can be done as a drift dive. The southernmost entrance is the easiest with a sandy cove where you can walk into the water. The other entrances are classic Oregon jetty scrambles. You want to stick close to the jetty at this dive site. From the base to the half-way point, the dive site runs more or less to the north. Then the jetty hooks toward the west. If you want a navigational challenge and you have someone on the other side to meet you, you could navigate underwater across the channel and come up at the SCUBA Park. We know someone who did this a few years ago. The south end of the site has a protected area where you can make an easy entrance/exit. We suggest exiting here. Get in at the top of the dive site and ride the current into the bay before high tide. The easiest entrance/exit is at the very southern end of the dive site. The south jetty middle area is accessible anywhere along Sand Dunes Road. The jetty entrances are a scramble (are there any that aren’t in Oregon?!). The sandy beach entrance at the southern end of the site is nice enough that you might want to only explore around this area rather than try the drift dive and have to scramble over jetty rocks. The further out toward the ocean you go on this site, the more surf, surge, and general nastiness you might encounter. There is almost always current on this site. Right at high tide, everything slacks off for a few minutes and the water is calm. The rest of the time, the water is really ripping and you’ll be taken where the tide is headed. Except during storms, viz here should be around 15-20 feet. Temperature can vary between 45 and 55F depending on the time of the year. We like diving this site in the spring and fall although it is accessible at any time. At the southern end of the site, you’ll probably find 30 feet of water where the channel swings close into the jetty. At the northern end, you’re more likely to find around 20 feet although these numbers are dependent on when the shipping channel was last dredged and if there have been any big storms recently. We’ve heard that sometimes you can find potholes along the jetty that get to be 45 feet deep although we can’t confirm that. It’s a good idea to have advanced open water training and drift diver specialty training before attempting to do a drift dive here. We rate this as an intermediate dive as long as you’re heading into Siuslaw Bay rather than out to sea. It all depends on where you park. If you’re lucky, you’ll walk 50 feet. If not, you will walk 1000+ feet. If you have two cars, then you can shuttle gear and people. Otherwise, you’ll have to walk back to your car after a drift dive (2000+ feet is possible). No surface swim is necessary here. This is a drift dive so plan accordingly. It’s a good idea to carry a good dive knife to cut yourself out of any monofilament you might encounter and a dive flag so that boats know where you are at. There used to be a shop with an air fill station in Florence but it closed a long time ago. Now you have to go down to Port Orford or up to Depoe Bay for an air fill station (both by appointment only) or inland to Eugene for a full service SCUBA shop. The waterfront in old town Florence has a lot of good places to eat. There are a pile of county, state, and federal campgrounds in the area plus a few private ones. We haven’t tried any of the local hotels so please get in touch with us if you know of a good one where divers are welcome.